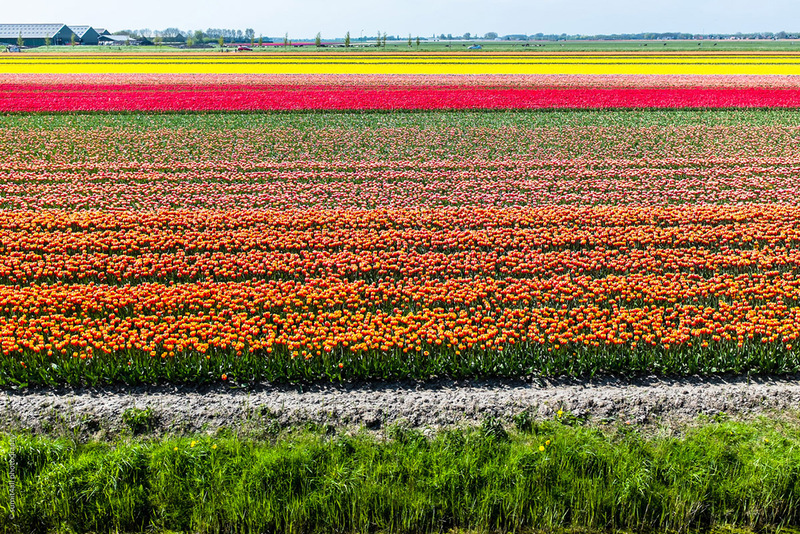 There is no experience like visiting the vast tulip fields in the Netherlands. One cannot even imagine the exotic beauty of a colourful landscape with rows and rows of multi-coloured flowers unless one actually sees the spectacle first hand. I feel myself lucky to be living in Amsterdam, where I get to witness the beauty of these tulip fields every year. 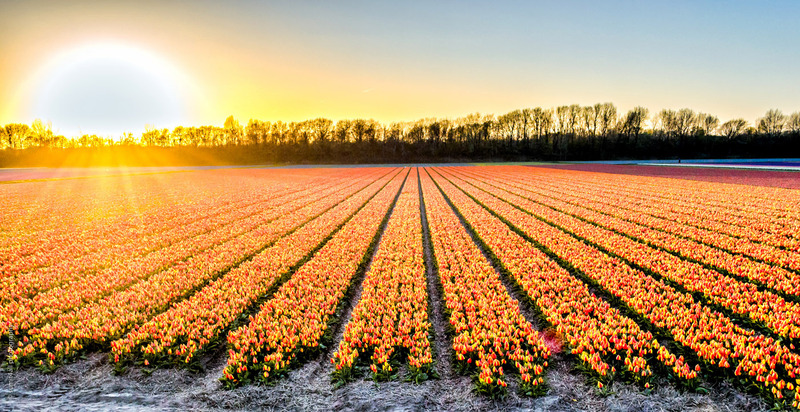 In the below photographs you will see why the Tulip Season is the best time to visit Netherlands. I always love walking among the tulip fields during the season that spans from mid-March to mid-May. 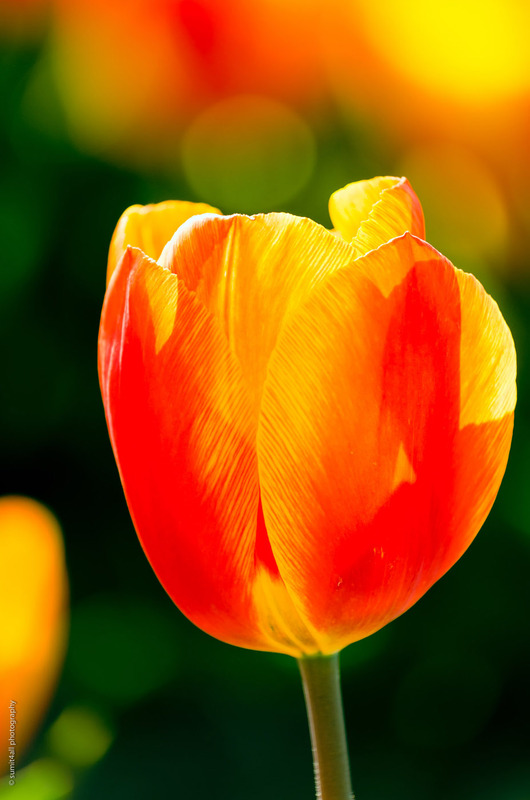 Tulips are essentially perennial flowers that begin their blooming season in spring time. A number of events, festivals, parades and auctions and tours are arranged during the tulip season. The morning dew on the tulips and the chill in the air remind me that it was winters just a few weeks ago, while the sunshine bouncing and refracting off the dew drops on the flower petals is an invitation for the warmth of spring. 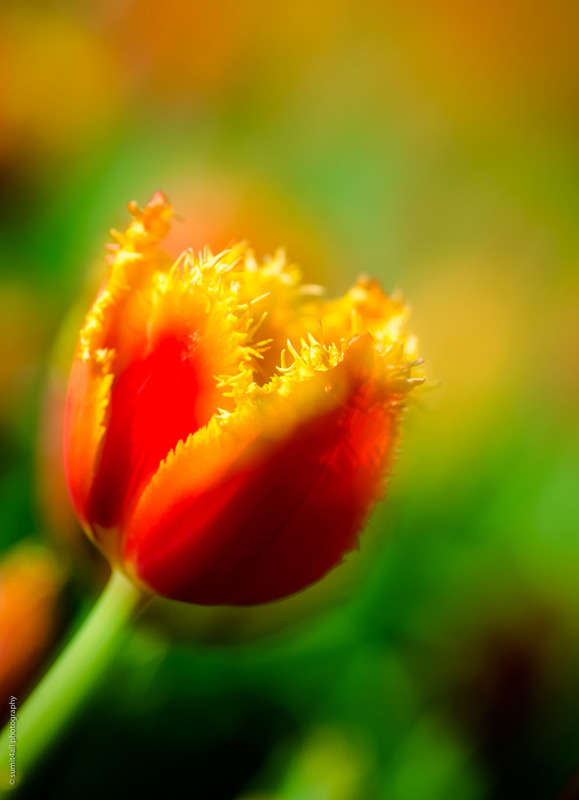 The above photograph was taken during sunset, when the golden rays of the setting sun lit up the orange, red and yellow tulips, giving off a fiery glow. In the vast expanse one can see purple, white and blue tulips as well. I always find fields filled with rows and rows of tulips a pleasure to the eyes and a comfort to the heart. Among such beauty often I find tears down my cheek one moment, only to be followed by a warm smile on my face the next. 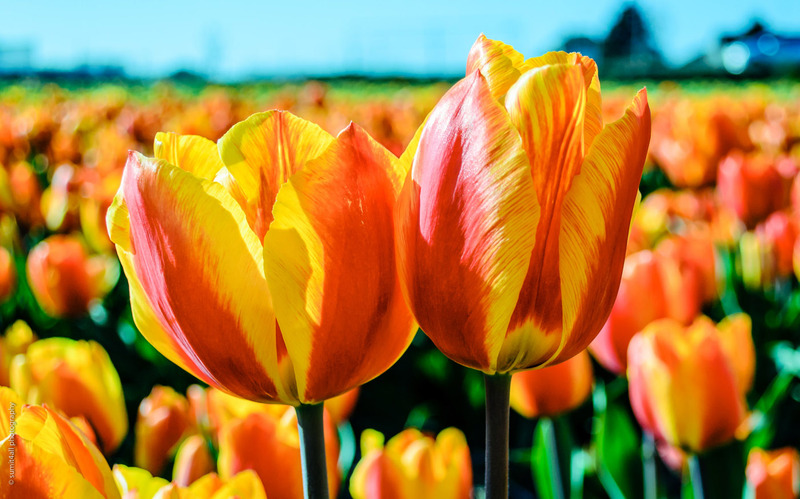 Though as native to the Netherlands as bicycles and windmills, the tulip, surprisingly, was introduced to Europe by Ogier de Busbecq, the ambassador of Ferdinand I, Holy Roman Emperor during his stay in the Ottoman Empire in 1554. The tulip bulbs were soon seen across the cities of Augsburg, Antwerp and Amsterdam. Four decades later, after the botanist Carolus Clusius planted the bulbs, he found that the plants were able to withstand the harsher climates and produced beautiful flowers with fascinating saturated colours never seen in these regions before. The booming East Indies trade in the Netherlands channelled the popularity of the flowers and cultivation of new and more exotic varieties gained momentum. Soon the flowers became a symbol of status and luxury. This period was known as the Golden Age of Netherland’s economy. 1633-1634 were the starting years of the peak of the flower trade, where tulips became the fourth leading export product of the country. There was a time when no flowers actually exchanged hands, just contracts to buy bulbs were made and sold at the end of the season. In 1636 and 1637, while some bulbs contracts were changing hands about 10 times a day, the prices abruptly collapsed and the sales of the bulbs came to a grinding halt. This phenomenon is known as ‘Tulip Mania’. Amidst an overwhelming sense of awe, I took some of my favourite images standing among thousands of flowers in a tulip field near Lisse. I want my photographs to not just show, but also make the viewer experience the same sensation and joy I did. The way the flowers danced among the cool April breeze, it almost felt like a poem or a song in perfect rhythm. Every one around – the wind, the bees, and visitors like me and you, only felt like a witness to a moment of perfection. It seems everyone around the flowers was dancing to their rhythms. The photograph below symbolises love. These two flowers were taller than the other tulips nearby, and they were touching each other continuously while blowing in the cool breeze of the spring. I stood there for a while and tried different compositions until I finalised on this one. I do believe that luck plays a big role in making photographs that leave a lasting impact, and I must say I was lucky that day to find these two “love tulips“. During the tulip season there are a number of events, shows, parades, auctions and flower displays in the city during the tulip season. 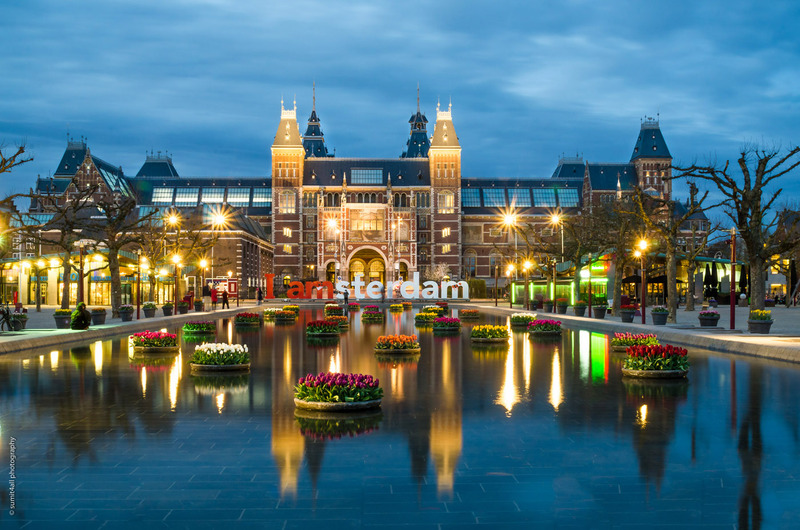 Another one of my favourite location in Amsterdam is the floating tulips in front of the Rijksmuseum with the famous ‘I amsterdam’ sign placed behind them. Below you can see a tighter composition of the floating tulips at the Rijksmuseum. The night sky is reflected in the waters and the orange lights create a perfect blend of contrasting colours. It is exactly the kind of photograph I want to make, a mix of city and nature, a mix of natural day light and artificial light of a city after sunset. 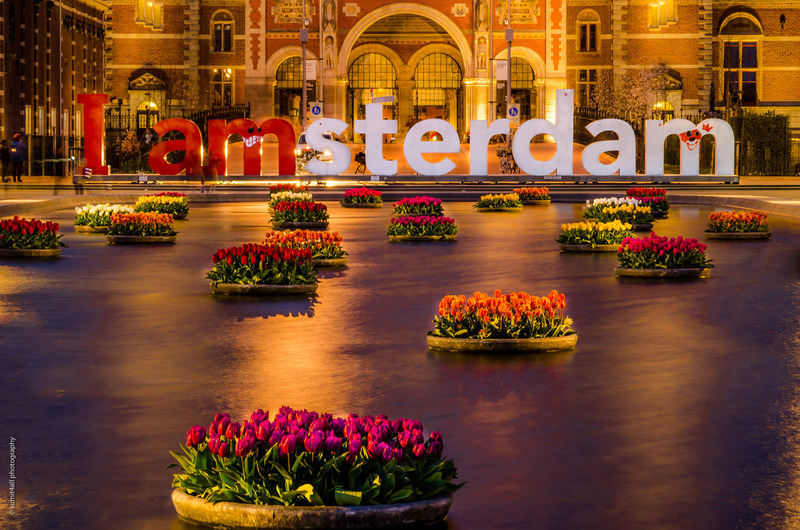 Finally, if you are in Netherlands during the Tulip Season, you must not miss the Keukenhof Gardens and the annual flower parade that passes through many different cities near it.